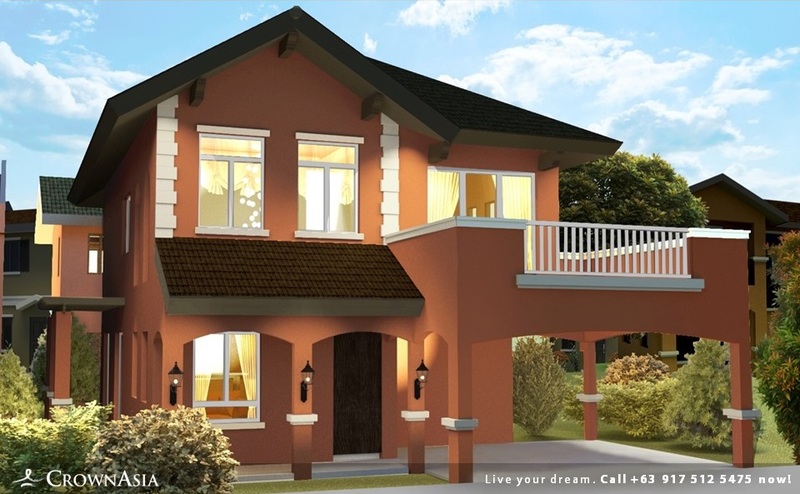 DESIGNER 211 MODEL in Crown Asia’s Citta Italia is a 2-storey premium Single Detached house and lot for sale in Molino Bacoor Cavite. 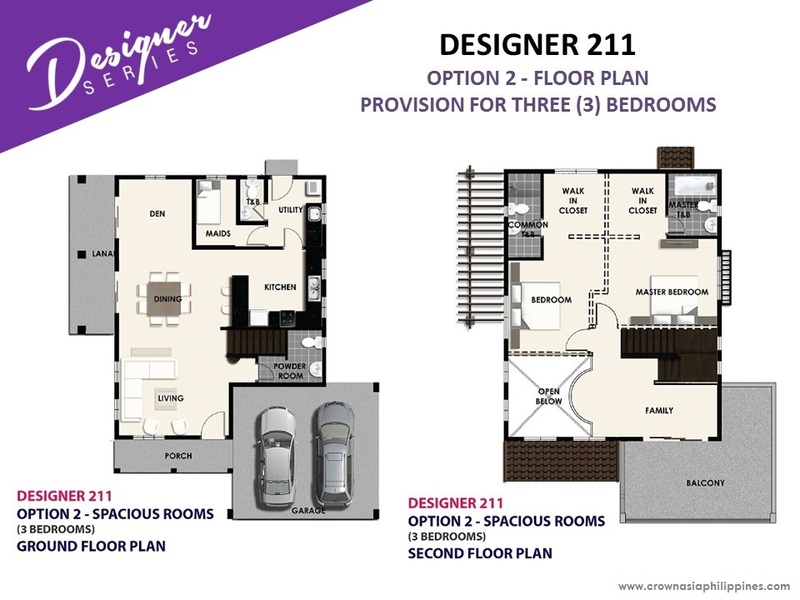 Designer 211 Model has a house floor area of 211 square meters built on a minimum lot area of 180 square meter. Designer 211 in Citta Italia has provision for maximum Five (5) Bedrooms, Three (3) Toilets & Bath, living room, dining area, kitchen, and provision for Two (2) Carports. Crown Asia – Designer Series adapt open space plans. Therefore the homebuyers have the freedom to design the layout or create spaces based on their needs and wants. Whether they are a big family and need more rooms, or just a single individual enjoying his independence, the open space plans may accommodate their needs. The price indicated below was last updated on March 18, 2019. Price may vary on the available lot size and lot type. Please contact us for an updated sample computation at +63 917 512 5475 or email us at inquire@residenciamanila.com. DESIGNER 211 MODEL does not include interior wall partitions. 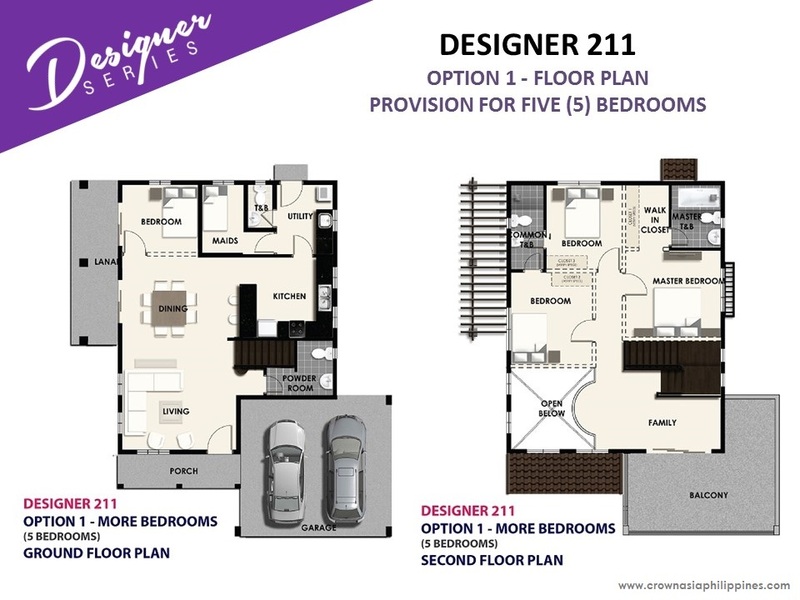 DESIGNER 211 MODEL also doesn’t include floor tiles upon turnover and no balcony upon turnover (except for Designer 142, Designer 166 and Designer 211 models which have balcony upon turnover). DESIGNER 211 MODEL in Citta Italia is a BASIC FINISH house model. The above photo of the dressed up house is the same exterior turnover and finishes for Designer 211 in Citta Italia. Landscape is not included on the turnover. EASY PUBLIC TRANSPORT ACCESS. Among the highlights of living in Crown Asia’s Citta Italia is its accessible location. Citta Italia is situated along Molino Boulevard, Bacoor, Cavite. GET AWAY FROM THE CITY WHILE STILL ENJOYING THE BENEFITS OF URBAN LIVING. 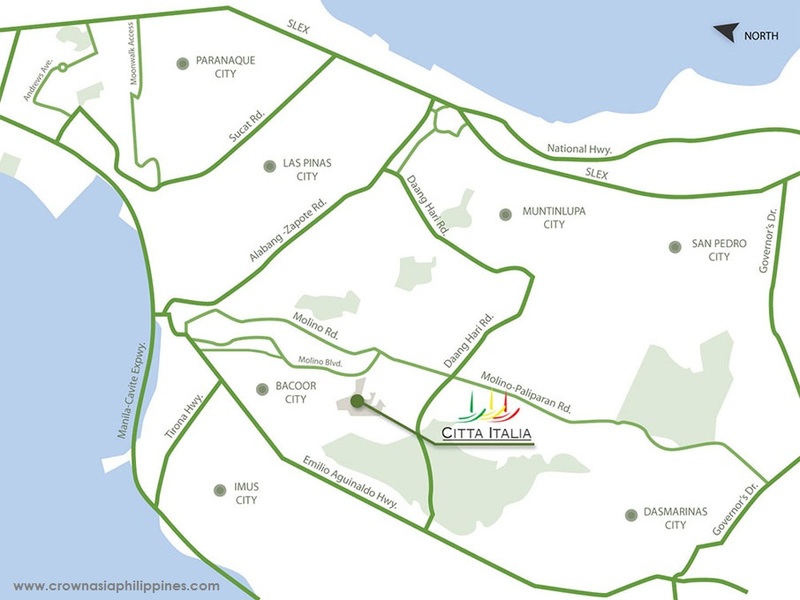 Citta Italia is just a mere 20 minutes away from SM Mall of Asia. Public transportation like Jeepney, Multicab, FX, GTExpress & UV Vans, that passes by Citta Italia are 24/7. Inside the village, a shuttle service is the mode of transportation. Citta Italia is Crown Asia 77-hectares exclusive community that offers homes that captivates you with cosmopolitan Italian lifestyle and elegance in the heart of Bacoor, Cavite. Citta Italia delivers its promise of bringing only the higher quality of life to you and your family. Citta Italia homes compel a classical facade to welcome you to a community that is exclusively designed to witness the magnificent grace of true Italian lifestyle. All 15 phases in this community are well-gated and guarded to ensure your safety and security. With a price starting at Php 6M, Crown Asia Citta Italia caters to people who seeks only the finest houses inside the most exclusive communities just outside of Manila. We value your family’s protection and we have carefully planned the following measures for your safety within Citta Italia.